Is it Bad Luck to Try on Engagement Rings? Like any major life events, engagements are filled with superstitions. One of these is the idea that trying on someone else's engagement ring or allowing another person to slip your ring on her finger might bring bad luck. How Common Is This Belief? While there are no statistics to indicate how many people believe trying on a ring could be bad luck, this is a common question on wedding-related message boards. The Knot reports this issue comes up frequently on its message boards and is the subject of passionate debate among brides-to-be. Some felt offended others would ask to wear the ring, simply because it's a special and personal item. Others worried another person wearing the ring would be bad luck for the marriage. There's very little established history on superstitions involving engagement rings, and none of these involve someone else wearing the ring. However, there are a few reasons people may believe it's bad luck. Some believe it's a bad omen to wear a ring on the left ring finger before you're actually engaged, as this could send the message that you are "taken." 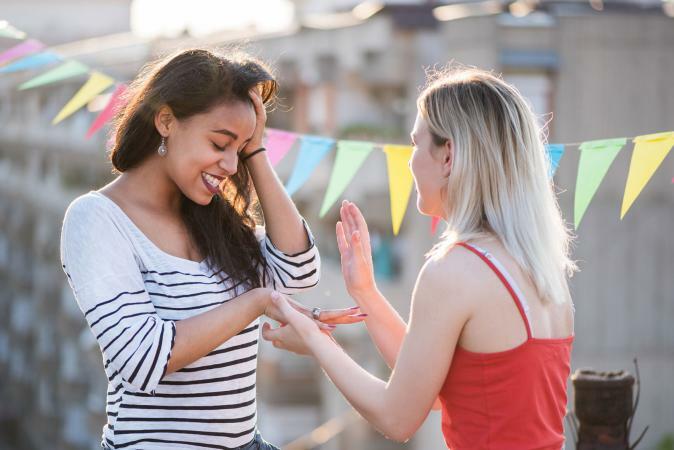 In years past, seeing an engagement ring on a woman's finger could be confusing for potential suitors, who might not have been able to ask politely about her relationship status. Gradually, this worry about confusion became a belief in bad luck. Since trying on a ring is wearing it briefly, this superstition could apply. The symbolism of an engagement ring may also be behind the superstition. Ultimately, this ring symbolizes the wearer's promise to love and be faithful to her fiance; it's about their emotional connection to other another. When another person wears the ring, it can seem she is changing that symbolism and inserting herself in the relationship. In time, this feeling may have become a superstition. Although rare, engagement ring mishaps can be emotionally devastating. When you let someone else try on a ring, you are releasing control over this sentimentally and financially valuable piece of jewelry. This uncomfortable feeling can easily become a sense of foreboding or the worry you're opening yourself up to bad luck. Ultimately, if letting someone else try on your ring (or trying on a friend's ring) feels like bad luck to you, you simply shouldn't do it. Superstitions aren't about logic; they are about emotion. Being engaged should be a joyful time in your life, so it's best to avoid any interaction that can take away from that. Next time someone asks to wear your ring or suggests you try hers, simply explain that you want to keep things positive during this special time.